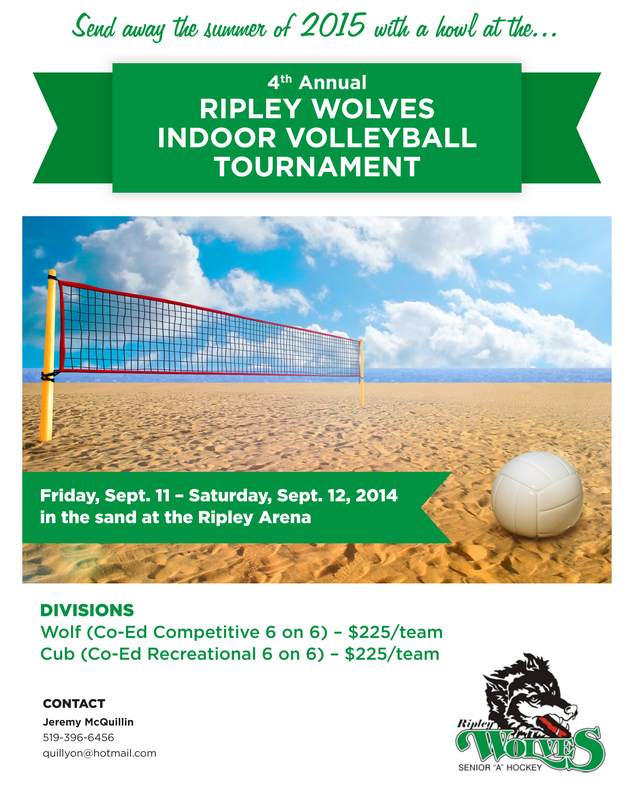 The 4th annual Ripley Wolves Indoor Beach Volleyball Tournament will be held Thursday, Sept. 10-Saturday, Sept. 12 in the sand in the Ripley Arena. The event kicks off on Thursday night with the second annual Business Night. Games will run from about 7 p.m. to midnight and there will be a bar and prizes. So get your employees and co-workers together for a great night of volleyball action. The main event begins Friday, Sept. 11, at 7 p.m. with co-ed competitive and co-ed recreational divisions kicking off play. It is $225 per team to enter. Fill out your entry form and email it to Jeremy McQuillin at quillyon@hotmail.com or call 519-396-6456 for more information.